Spooky Stories, Coming to a Bar Near You! Author rablogsplPosted on October 18, 2018 October 25, 2018 Categories BOOKS, Library Events, LOCAL INTERESTTags #Booktoberfest18, Booktberfest, David W., hallowe'en, Spooky Stories, Thrilling Tales, Thrilling Tales After DarkLeave a comment on Spooky Stories, Coming to a Bar Near You! Don’t be afraid of the dark: Thrilling Tales just for you! 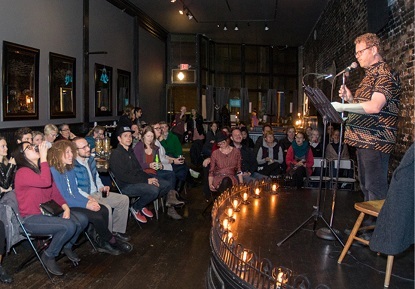 For several years now, audiences have been flocking to our twice monthly lunch hour program Thrilling Tales: A Storytime for Grownups, and every so often someone tells us they wish there were an evening version of these readings. Well, it’s finally happening! Author rablogsplPosted on June 8, 2018 June 13, 2018 Categories BOOKS, Events, Fantasy, Library Events, LOCAL INTEREST, Mystery and Crime, Science FictionTags David W., Ray Bradbury, Shirley Jackson, storytelling, storytime, Thrilling Tales, Thrilling Tales After DarkLeave a comment on Don’t be afraid of the dark: Thrilling Tales just for you!